Um I love Gilmore Girls so I am super excited you did this!!! And honestly your answers are perfect. I mean Gabby is the best best friend ever. Parker is the bets super honest snarky character. I also love Thorne!! I totally have to do this tag!!! Bookaholic 007, OMG you MUST watch Gilmore Girls NOW!! It is amazing. I don't think I have heard of Radio Silence, but if it has a great mother/daughter relationship, I may have to check that out. Those are few and far between in books, unfortunately. I admit, I have only seen a handful of GG episodes. I have no idea why, you'd think I would have loved it. It just happened to fall during a time where I wasn't watching many shows, I think. These are great choices, especially Emmy & Oliver, Denton, and absolutely ANYTHING involving Shazi and/or Khalid! And I WILL probably watch the revival, because I watched enough of it to know the basics, and frankly, I LOVE this wave of revivals. Can someone get the gang from Dawson's back together? Felicity? Please? Shannon, oh this would be the perfect time to binge watch it. It's SO GOOD! And okay, if there were revivals of Dawson's creek or Felicity . . . that would be the icing on the cake. I would LOVE one of Dawson's Creek for sure! I just rewatched the whole show on DVD!!! :D So, yeah, I'm pretty excited about the revival! Hope to find time to do this tag - love it! Thanks Ramona! I hope you do too! I need to watch it again because I just love it so much. OMG!! I love this tag! 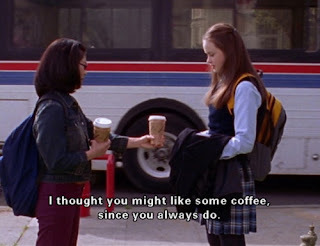 I loved Gilmore Girls although I'll admit the show frustrated me a lot too. It seems I REALLY need to meet Gaby from Maybe In Another Life! Nick, Gilmore Girls is my FAVORITE SHOW EVER! I think the last season frustrated me, but most of it was wonderful. Hopefully Sookie will make an appearance after all. I want her there! I've never read We'll Always Have Paris...but when I saw it - I immediately thought of Paris Geller haha, because of how this is a Gilmore Girls tag! Geraldine, haha you are so right! I love the character of Paris, but for some reason I missed that when I chose the book. Ha. I can understand why you didn't watch the last episode. I didn't either until last year. I was so bummed when it was cancelled. Thanks Lucia! I hope you do it. I would love to see your choices. I need to rewatch it from the beginning. I love it so much! Love this, I adore the Gilmore Girls and can't wait for the revival. And yes Team Jess forever! Now I really want to read Emmy & Oliver especially if they remind you of Loreleli and Luke. Thanks Trish! Emmy & Oliver was such a good book. Their friendship turned romance was so cute. You definitely need to read it! I have never wanted to do a tag more than this one! Thank you so much for creating this it's exactly what I've been missing in my life. I've been a Glimore Girls fan since I was like 10 and I am SO EXCITED for the revivial. Also, you're offically one of my favorite people ever because #teamJess! And I love how you didn't give Dean a question. Oh Shay, I really hope you do this one! I would love to see your choices! When I heard about the revival, I may or may not have squealed in delight. I am so freaking happy. And yeah, I thought about giving Dean a question for about 2.5 seconds, but then I thought "nah, better not." I just didn't think his character was worth it. And I liked Logan better than Dean. But I am still #teamJess all the way! I did this tag on my blog too! (www.readgabrepeat.com) thanks so much for the questions! It was so much fun! I can't believe I only just found this post - I LOVE that you created a Gilmore Girls tag. I am OBSESSED with the show, and keep thinking I'll wake up one day and find out the revival was all a glorious dream. hehe. I know! Me too!! Wouldn't that just be TRAGIC??? So help me, NOTHING BETTER STOP THIS REVIVAL!! I absolutely freaking love this show.